Chamonix (pronounced sham-oh-NEE) is a lovely five bedroom chalet at the top of Snowshoe Mountain in West Virginia. 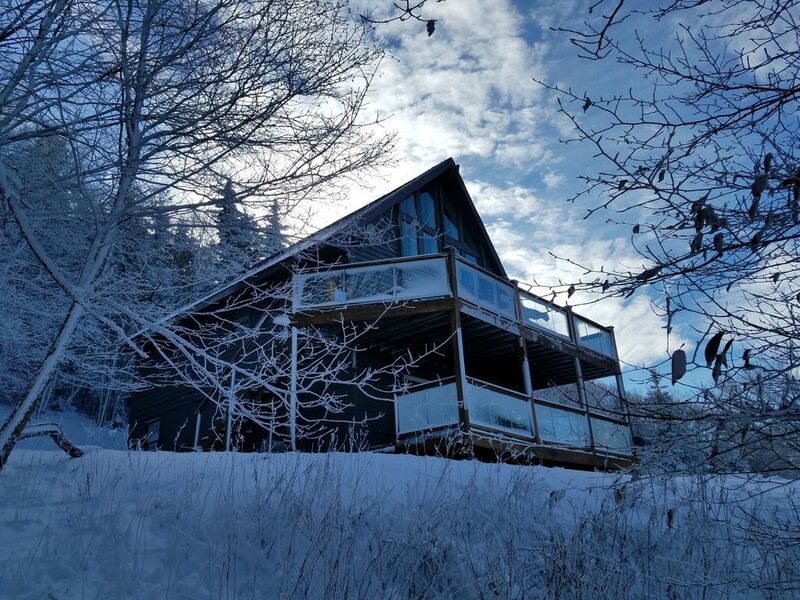 Situated on 2 private acres with stunning views, Chamonix offers convenient access to Snowshoe slopes and other activities via a private on-call shuttle that picks you up at the end of the driveway. Chamonix is convenient to year-round family activities including mountain biking, kayaking, horseback riding, hiking, snowmobiling, and of course, skiing and snowboarding at the Snowshoe Mountain resort. 1. Cell coverage & Wifi. Unlike many homes on Westridge Road, you’ll get 3 bars of 4G service at the house for AT&T mobile users. Hi-speed internet is provided by Frontier FIOS. TV Service is provided by Dish Network and has 120 channels. 2. Easy Access. Most homes at Snowshoe have steep driveways that can be a challenge even for four-wheel-drive vehicles. At Chamonix, you drive up a gently-sloping road that is maintained by the county right up to the front door. Front-wheel drive vehicles are usually ok, but if we get a big snow, getting anywhere on the mountain will be a challenge without 4-wheel drive. 3. Handicapped Accessible. Mobility-challenged persons will enjoy being able to enter the home from the parking area with NO STAIRS to scale. They can stay in a first-floor bedroom and enjoy the first-floor living area, dining area, bathroom, and deck without having to navigate any stairs. Please note, there are no cooking facilities on the first floor and the 1st-floor bathroom is not handicapped equipped. 4. Magnificent Sunsets. The home faces west from one of the highest points in West Virginia. Sunsets are breathtaking. 5. On-Call Shuttle. Unlike the scheduled shuttles that service other areas of Snowshow, Chamonix is serviced by an on-call shuttle that picks you up at the end of the driveway. The shuttle usually arrives within 5 minutes of your call, and will take you to Snowshoe Village or Silver Creek or anywhere in between. At the end of the day, just call the shuttle from the slopes or a restaurant, and they’ll whisk you safely back home to Chamonix. - The precise location of Chamonix is here: https://goo.gl/maps/RMjCpuyn4bp Cup Run is an within easy walking distance (500 yards). - Shuttle Details: The shuttle operates from 8:00am to midnight 7 days per week. From Christmas week through the end of February, shuttle hours are extended through 2:00am on Friday and Saturday night. Any business on the mountain will call the shuttle for you to get you home if you don't have a cell phone. Although born in the US, Amy spent much of her childhood in France. While living outside of Paris, her family took a very memorable holiday to the villiage of Chamonix in the French Alps. She has always had fond memories of skiing there, so we borrowed the name for our chalet. We love the secluded feel of the chalet, while having the convenience of being so close to the slopes and the villiage. Chamonix is close enough to the village to enjoy all the benefits of being on the mountain, while still being private and quiet. I've stayed in other properties on the mountain where the houses are packed close together and revelers wake you at night singing in the hot tub next door or talking loudly in the street. Chamonix is secluded and quiet, but everything is so convenient thanks to the on-call shuttle. Up to 5 cars can park right by the front door with easy access without steps. Four flat-screen TVs. Two have DISH network and ROKU devices and DVD players. The two in the bedrooms are only for playing DVDs or connecting your PC. A small selection of family-friendly movies. Deck off the 2nd floor overlooks the mountains. Short walk to Cup Run. Private on-call shuttle takes you to/from any slope. Guests can enter the 1st floor from the parking lot without having to scale stairs. The 1st floor has sleeping, bath, laundry, and living areas, but does not have cooking facilities. Bathrooms are not handicapped equipped. Great home and responsive owner. House & features exactly as stated on VRBO. Really enjoyed our stay. Spacious home with nice great room, wood burning stove and hot tub. Approx 1 mile away from village but on-demand shuttle makes it convenient.